My husband and I have been married for almost 6 years. 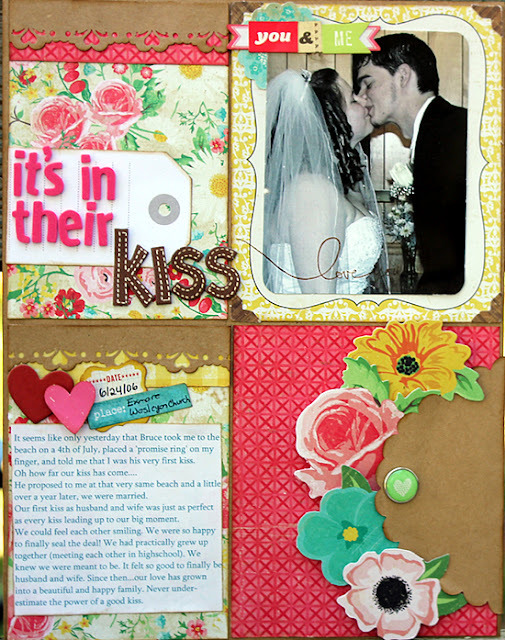 Can you believe that I have not scrapbooked even ONE wedding photo? Well....that was until yesterday! I finally scrapped one and I believe this will be the first of many 'wedding' layouts. No worries, though! They are not overly 'themey' at all. This layout was inspired by Jen Gallacher's "Life" layout. I originally put it together for one of Shimelle's contests but I don't think I got it posted in time. Oops! It's an 8.5x11 layout. The papers and majority of embellishments are from Crate Paper's Emma's Shoppe collection. The photo is our first kiss as husband and wife. The journaling just tells the story of how my husband told me years before we got engaged that I was his very first kiss and how far our 'kiss' has come. I did a little stamping on the photo (that says "Love You" but it didn't show up all that well. The stamp is Love Always Wins By Ali Edwards. I used a Fiskar's border punch on the top of two of the squares just for added interest. 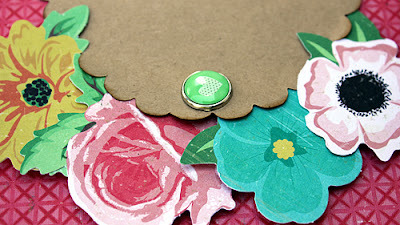 The scalloped craft bit that's over the flowers is a Maya Road kraft envelope. The few embellishments that are not from the Emma's Shoppe collection are from American Craft's Dear Lizzy Neapolitan collection ("you&me" stickers and heart brad) and My Mind's Eye "Miss Caroline" collection ("place" sticker). I believe both of the hearts are from October Afternoon. 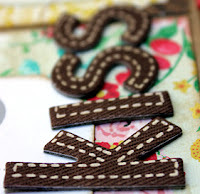 The title is spelled out using Daydreams Rasberry Foam Thickers and Amy Tangerine Hello Truffle Fabric Printed Thickers. See the caps? I really need it!!!! great layout! love all the different embellies!! Beautiful layout, gorgeous colors and such a romantic story. love it! Love your page! It is not themey at all! Great title and love the design, and great colors. Your clustering and the journaling is fab! Pretty Page! Love the embellishments and colors. TFS! You did an amazing job Christine! I love the colors with the black and white photo. I've been married three years and slowly but surely working on my wedding album. LOVING this! The flowers with that envelope? Fantastic! Oh, wow. This is beautiful! Love this page. I could look at it all day. Never too late to scrap something :) Love how did the quadrants with envelopes. Pretty, pretty. This is gorgeous! Love the bright colors...so much more fun than the typical silver white and black!!! Great page. Love the quadrants the flowers and borders. I'm not gonnalie, the journaling made me tear up a little, it's so sweet. I love the stamping on the photo. Oh, you've got me singing that song! Lovely layout, how exciting that you have so many more wedding photos waiting to be scrapped! Beautiful layout and story! Lovely colors!